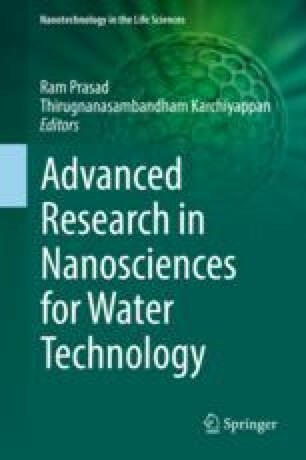 In this modern era, nanotechnology is offering great potential for the treatment of wastewater in an extraordinary way as compared to the commercial methods. Traditional wastewater treatments involve high costs and deal with heavy metals. Use of nanomaterials for cleaning wastewater is a recent approach. On the contrary, use of various novel nanomaterials synthesized in-situ for the treatment of wastewater reduced with different pollutants, such as organic and inorganic content, toxic heavy metal ions have been exemplified, due to their unique activity towards contaminants. The fields of nano-biotechnology and nanotechnology are under active research for the application of wastewater treatment. Nanoparticles consist of many strategies such as ultrafiltration membrane, osmosis, sorption, nano-filtration degradation, advanced oxidation process and water remediation as well as disinfection through nanomaterials. In wastewater, the eliminating contaminant concentration efficiency of nanoparticles is dependent upon the physical and chemical characteristics of nanomaterial, the contaminant, and wastewater. Actually various nanoparticles channel with nanofibers, and carbon nanotubes are one of the developing items which are used as a part of nanotechnology.